I don’t know what it is about SONIC. It’s not their prices (not bad, by the way). It’s not their amusing commercials. It’s certainly not their food. Perhaps it’s that SONIC fills the void left by A&W, an American institution that — like the drive-in theater — has largely become a dwindling relic of two generations past. But I loves me some SONIC. 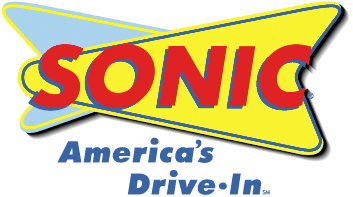 For years, the closest SONIC was in Anaheim, about 90 miles north on I-5. It was just far enough away to never be a sole reason for a jaunt to the OC, but close enough that we (San Diegans) would see their commercials. A couple years ago, Santee (east of San Diego by a few minutes) got their own SONIC, and by all accounts it’s the most popular thing in that town. Sorry to break the news, Kragen Auto Parts. 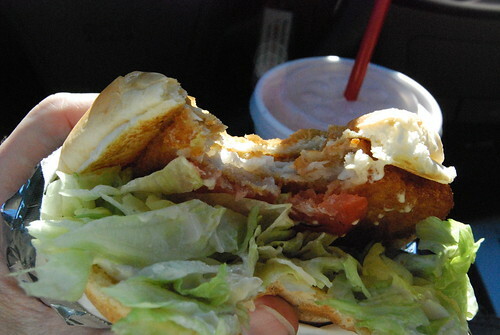 I remember having a fish sandwich at the Anaheim SONIC so I drove out to Santee to sample theirs. Thing is, they don’t have it. WHAT? I guess it’s a “specialty” menu item that isn’t universally offered at every drive-in. Well, crap — that’s ONE wasted trip to Santee. But as luck would have it, a couple weeks later I found myself driving to Phoenix and I spotted a SONIC billboard in Yuma, AZ. Camera in hand, low on fuel (both car and my stomach) and making good time, I took the opportunity. My sandwich experience was fairly mundane, made exciting only by the 20oz. of Cherry Limeade that promised to quench my thirst. The first thing about the sandwich is that it must’ve been fried to order, because A) it took nearly 10 minutes to arrive at the drive-thru window, and B) it was insanely hot. In fact, I popped over to a Circle K, filled up the tank and by time I returned to the sandwich, it was still almost too hot to eat. And here’s my review: yep, it’s a $2.99 fish sandwich all right. I wish it was more exciting than that. The fish was good, the tomato was fine (this is high praise from me considering I’m not a person that consumes tomatoes on a regular basis) the bun was soft and the tartar sauce was typical. But that’s what you get at SONIC — average food, awesome drinks and a little bit of modernized mid-20th century nostalgia. Sadly, I did their drive-thru… not even experiencing their rollerskating carhops. I guess it’s just as well; if their burgers and fish sandwiches matched the flavor of their drinks and shakes, I’d be road-trippin’ to Santee far too often. Maybe even justifying more road trips to AZ. I hate the food I lovvvve the ice cream-y drinks. Weird that Sonic in Santee doesn’t have fish tacos. It proves my theory that they have no taste over there. My brother-in-law always raves about Sonic in Las Vegas, so once we tried the one in Anaheim. I wasn’t impressed with the burger, and that one didn’t have the carhop on roller skates. I’ve only had milkshakes at the Santee Sonic, but should try their food one of these days. Isn’t there a Sonic in Vista now, too? Chula Vista had a Sonic location waaaaay back in the day. On 3rd ave next to a BK. Maybe 20 years ago? The concept didn’t work and it closed down after a few months. We live in North Texas. When are the fish sandwiches going on the menu? My local sonic in Southeastern Colorado only serves the Fish Sandwich during the Lent and Easter Season. As I don’t like hamburgers and love fish sandwiches I wait all year for Lent and Easter to come around to have a fish sandwich at Sonic. They use to have it on the menu as a regular item, but several years ago went to just serving it during Lent and Easter. I know I am not the only one that enjoys the Fish Sandwich and I have asked them to bring it back to their regular menu for customers like myself several times so far with no avail.